There are a few different scenarios when you may need to complete or cancel a proposal. If you've completed all the work for the proposal before you reach the end date and you are not billing on a monthly recurring basis, then once you have invoiced all the services in the proposal, you may want to mark the proposal as completed. If you are billing on a Recurring basis, or if you have Recurring Jobs being deployed, then you should not mark the proposal as completed unless you do not want to continue to bill the client for this proposal as it will cease all invoicing and job creation. If you or your client decide they want to exit the agreement part way through the proposal period, you may also want to mark it as 'completed'. 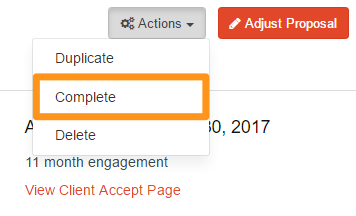 This will keep processing any invoices or payments that have already been initiated, but not create any future invoices, or jobs. 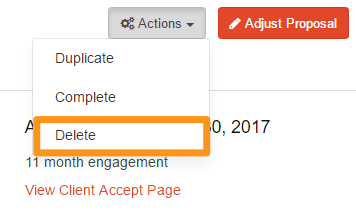 If you haven't actually started any work on the proposal or invoiced anything, you may just want to delete the proposal altogether. If before any work has been started on the proposal, it is decided that you won't go ahead, it's better to 'delete' the proposal. Doing this will mark it as deleted, but there will still be a record there of the deleted proposal in the system.